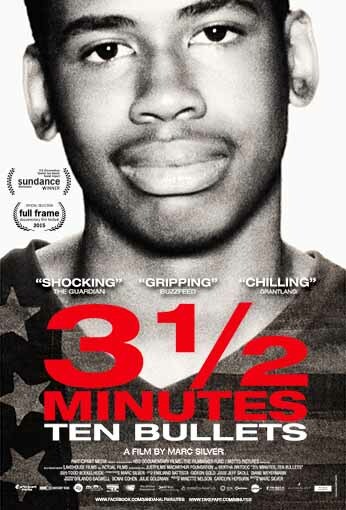 3 1/2 Minutes, Ten Bullets reveals what happened during the brief few minutes when two disparate lives intersected and were forever altered. On Black Friday 2012 at a Florida gas station, two cars parked next to each other for those passing moments and the interaction between them was devastating. A white middle-aged male and a black teenager exchanged angry words over the volume of the music in the boy’s car. A gun entered the exchange and one of them was left dead. Michael Dunn fired 10 bullets at a car full of unarmed teenagers and then fled. Three of those bullets hit 17-year-old Jordan Davis, who died at the scene. Arrested the next day, Dunn claimed he shot in self defense. Thus began the long journey of unraveling the truth and understanding actual threat versus perceived threat. 3 1/2 Minutes, Ten Bullets follows that journey, interweaving the night of the murder with the trial. What is revealed are deep racial prejudices and the tragedies that ensue too often in America. Directed by Marc Silver (Who is Dayani Cristal? ), the documentary intercuts powerful exclusive footage from a riveting trial with intimate, observational scenes of Jordan’s parents, Ron and Lucy. We see firsthand how difficult it is for them to grapple with unimaginable loss while fighting for justice for their son. The film integrates police interrogation footage, prison phone recordings and interviews with the other boys who were in the car that night. The result is a powerfully moving exposé that calls into question racial bias and the search for justice within the judicial system. Now avaiable on iTunes and Blu-Ray.